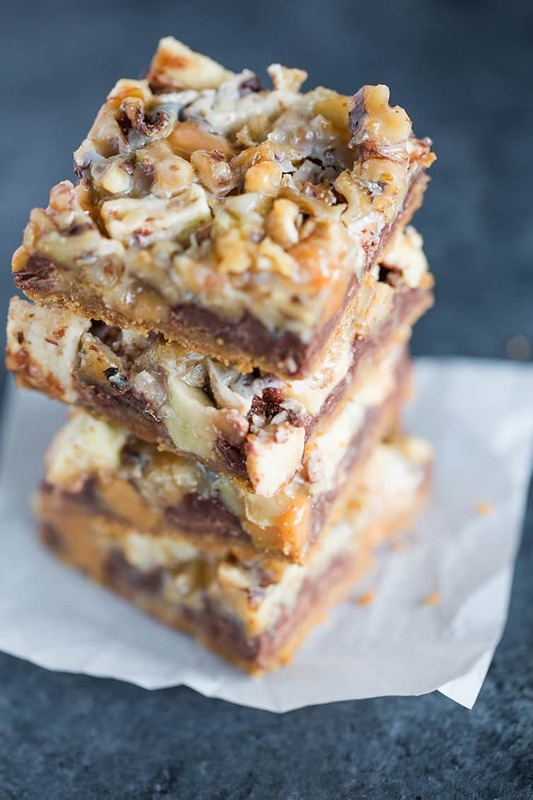 These caramel apple magic bars combine all of the fabulous flavors of the season with layers of cinnamon-graham crust, chocolate chips, caramels, chopped apple, and walnuts, all drenched in fabulous sweetened condensed milk. This recipe is sponsored by Eagle Brand Sweetened Condensed Milk. Mmmmm caramel apple… one of my all-time favorite fall indulgences, and a flavor combination I love to incorporate into as many desserts as possible once the cool weather hits. 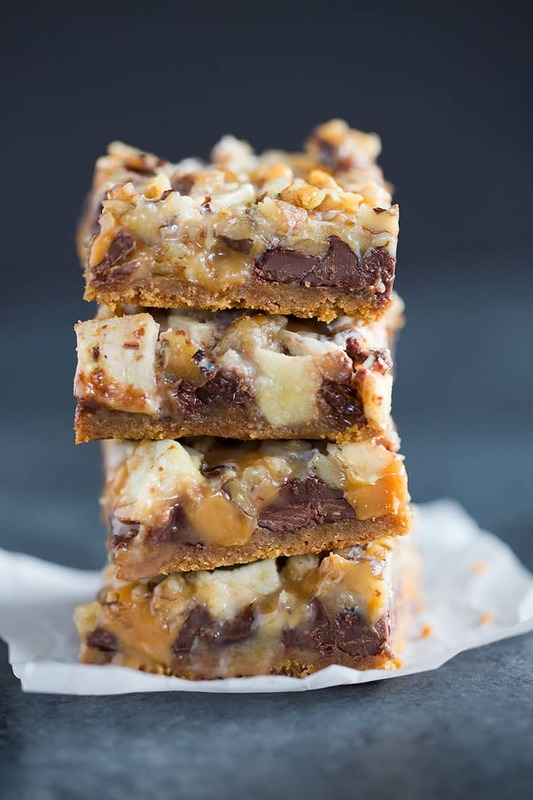 If you haven’t heard of magic bars before, they also go by the name seven layer bars, dream bars, and hello Dolly bars, whew those are a lot of names! The classic bar features a graham crust with layers of pecans, chocolate chips, white chocolate chips, butterscotch chips, and coconut. The best part of these type of bars? There are endless variations! Depending on your taste preferences, the season, or the occasion, you can mix them up however you’d like! The star of any batch of magic bars is the beauty that is sweetened condensed milk. Take milk, strip out the water, add sugar, and voila! 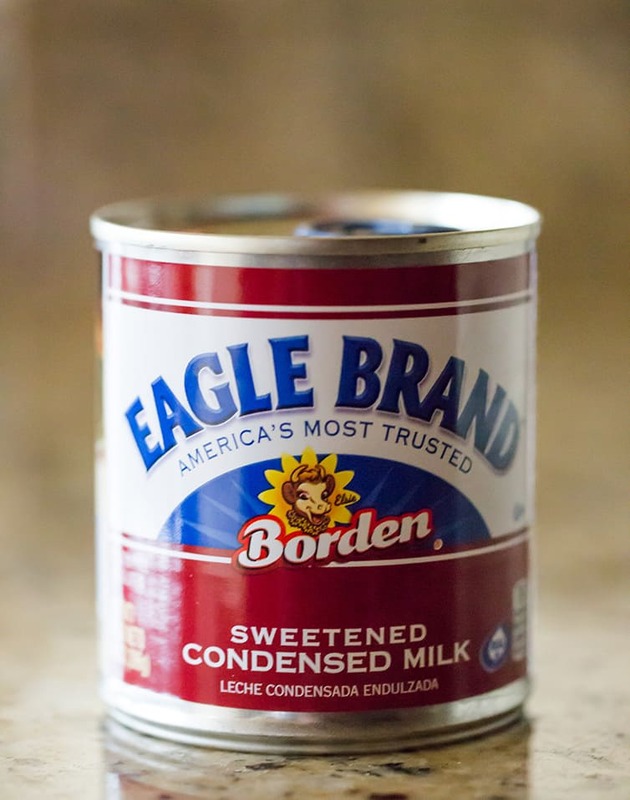 Sweetened condensed milk… sweet, creamy, delicious sweetened condensed milk. I don’t know about you, but the holidays can make even the most organized, type-A person (ahem, me) feel totally scattered and like time is constantly ticking down. Throw in a toddler and 13-month old, and the feeling just exacerbates. I’ve talked about it here a number of times since having Dominic last year, but I’ve really tried to do a better job of giving myself grace, especially when the situation can easily allow for it. Which is exactly why I have teamed up with Eagle Brand this holiday season to bring you recipes that are uncomplicated and allow you to stress less and focus more on the reason for the holidays in the first place – to surround ourselves with friends and family and enjoy some special time. Eagle Brand has launched the Uncookie Exchange, which encourages home bakers to embrace desserts other than cookies, recipes that are simpler and take less time, so you have more time available for the things that really matter. This sentiment has my name ALL OVER IT. So… hello, bar cookies! No chilling dough, no scooping, no shaping, no rolling or cutting. One bowl and a cutting board is all you need! 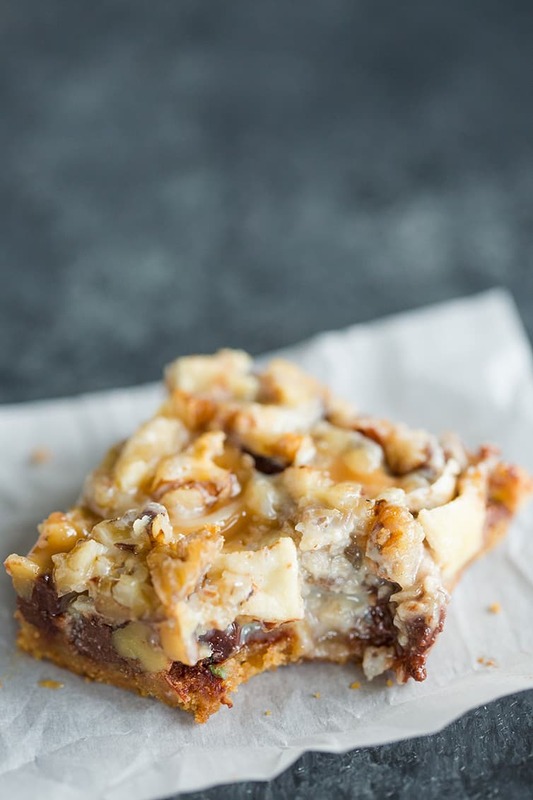 I love, love, love how quick and super easy these caramel apple magic bars are to make – just stir together the crust, and then just sprinkle on the ingredients, pour over the sweetened condensed milk, pop into the oven and you have an utterly addicting fall treat. I fall into the camp of people (a very small minority, I’m sure) who really don’t care much for pumpkin pie. I’ll eat a small sliver, but it would not bother me one bit if it didn’t show up on the Thanksgiving dessert table. Give me pecan pie, a trifle, or something simple and delicious, like these bars. Thanksgiving is such a massive food holiday and so much prep work goes into it that giving yourself some grace and baking up these caramel apple magic bars – super easy and a massive crowd pleaser – will get your holiday season started on the right foot! When planning your holiday dessert menus this year (so many occasions! Friendsgiving… Thanksgiving… Holiday parties… Cookie exchanges… Christmas… New Year’s! ), don’t forget to check out the Uncookie Exchange page to see these bars, and dozens more easy and delicious recipes! 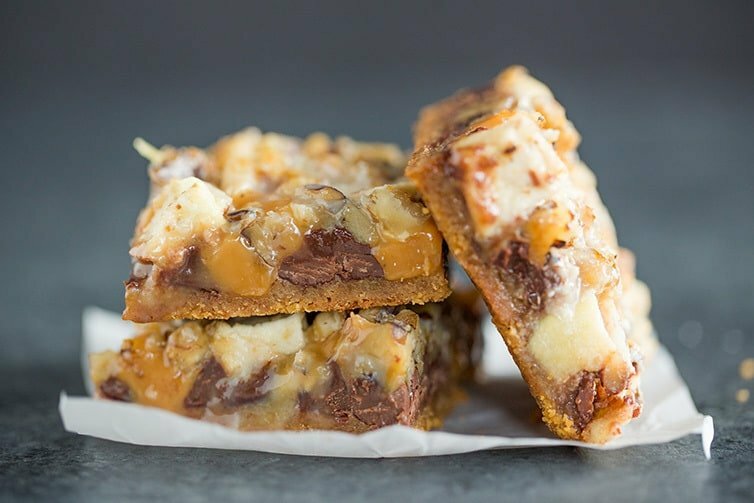 Caramel Apple Magic Bars feature a graham crust, chocolate chips, chopped up caramels, chopped apples, and walnuts. An easy must-make recipe for fall! Preheat oven to 350 degrees F. Line a 9x13-inch baking pan with foil and spray with non-stick cooking spray. Make the Crust: In a medium bowl, stir together the graham cracker crumbs, brown sugar, cinnamon and salt. Add the melted butter and stir with a fork until the mixture is evenly moistened. Turn the mixture out into the prepared pan and press into an even layer on the bottom of the pan. Assemble the Bars: On top of the crust, sprinkle the chocolate chips, caramels, chopped apple, and walnuts (in that order). 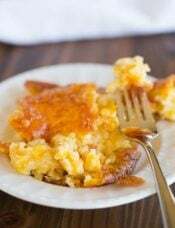 Drizzle the sweetened condensed milk evenly over the entire mixture. Using the back of a spoon, gently press down on the mixture so that most of it is at least partially submerged in the milk. Bake the Bars: Bake until the edges of the bars are golden brown and the center is set, about 30 to 35 minutes. 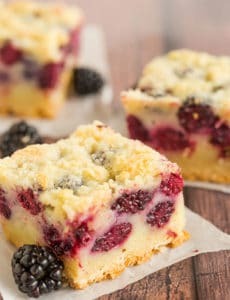 Allow to cool completely in the pan, then remove and slice into squares. The bars can be stored at room temperature in an airtight container for up to 5 days. You can buy the boxed graham cracker crumbs or crush your own. I find that running them through the food processor makes the best crumbs, versus crushing them with a rolling pin or something similar. I used these caramels for the recipe. I used Granny Smith apples because I think the tartness contrasts really well with the other sweet components of the bars, but feel free to use your favorite apple, or whatever you have on hand. While I used walnuts for the recipe, feel free to use whatever nuts you'd like - pecans would be great, too, and if we didn't have a peanut allergy in our house, you can bet that would have been my #1 choice! Thank you to Eagle Brand for sponsoring this post! 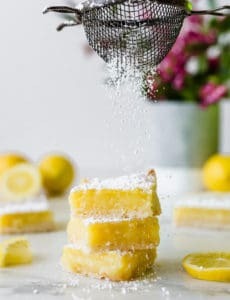 I would like to make these for a friendsgiving dinner I am hosting. However, we do have some people with nut allergies. I am wondering if I could use coconut and white choco chips in place of the nuts..
Hi Carrie, I think those would make great substitutes! Enjoy! Now that I think of it I wonder if pretzels would be a good additions instead of nuts.. So I made subbing pretzels and white Choco chips for nuts. Amaaaaazing! My question, do you think these will freeze well till I serve in a few weeks? I imaging I just let them defrost at room temp day of? Sounds delicious Carrie! And yes, these would freeze well! Thanks for a great recipe. I made these yesterday to bring to Thanksgiving dinner to go along with the pumpkin pies. They were delicious, rich and gooey. Everyone loved them! I saved a couple for myself and they were even better today. I used the Kraft Caramel Bits and used pecans instead of walnuts. I’ll definitely be making these again soon. I would recommend baking them the day before you need them rather than hours before so they get a chance to set a little more. So far I️ cannot get them to firm up so I’m putting the pan in the refrigerator overnight. Will that solve the problem? Hi Jennifer, Refrigerating will definitely help them firm up. Enjoy! So happy to hear you enjoyed them! Thanks for stopping back to leave a review! There was no magic here at all. I followed the recipe to the letter (weighed, measured carefully) and the bars did not firm up or release from the foil. I checked my oven temp (right on.) The pieces I could salvage were far too sweet for my taste and I usually love these sorts of bars. Sorry, I would not waste my ingredients again on this one. I made these yesterday and brought them to a gathering. People loved them! I did use the Kraft caramel bits instead of cutting up caramels, and I used peanuts instead of walnuts. Hi Melissa, So awesome to hear! I’m going to have to find those caramel bits for sure. And I can imagine this would be AMAZING with peanuts! I love the sound of the recipe for myself, but I am not allergic to nuts. A nephew I would love to send these to is allergic to all nuts and I’m wondering if there is an oatmeal substitute for the nut portion. Would be an interesting twist. What do you think? In fact, it would be an interesting addition to each recipe containing nuts, to make a note how to adjust the recipe to not include nuts. Hi MaryEllyn, My son is allergic to some nuts (although not walnuts! ), so I totally understand! You could try sprinkling the same amount of oats, but the structure would be altered a bit. 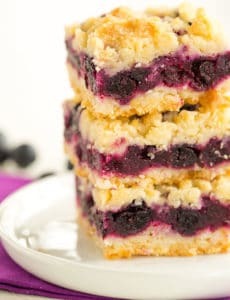 Might also want to add in some white chocolate chips to keep the structure of the bars. These sound divine. I am with you on Pumpkin Pie, I don’t like it at all…I’d rather have Pecan Pie or a Butter Tart (I’m Canadian). YES! Pecan pie allllllll the way! I loooove magic bars. Combining that with a caramel apple is such a great idea, these look amazing! Can you use the Kraft caramel bits as long as the weight is the same? Do they have the same consistency as classic caramels? Hi Kathleen, I have never baked with the caramel bits, but I have seen other recipes that offer them as an alternative to chopped caramels, so I think it would work okay! YUM these look great! What would you think of drizzling some homemade caramel versus using store bought candies? I NEVER have luck with them when I bake, they always end up hardening again in the oven. Would a caramel drizzle work or would that make these too soupy? Hi Angela, You could try it, but the caramels in this recipe do stay a little bit intact but very soft. With a drizzle of caramel sauce the bars might lose a little structure, but it doesn’t hurt to try!! I have a bar recipe with an oatmeal base that calls for drizzling 1/2 cup caramel sauce on it, it also has nuts and chocolate chips on it. It works well., not soupy at all. These look really good! I make Magic Turtle Bars with pecans, chocolate chips and caramel bits. Those caramel bits are great for recipes like this since you don’t have to spend a bunch of time unwrapping individual caramels and then cutting them up. The bits are little balls of caramel. In my grocery store they are in the baking aisle by the chocolate chips AND in the candy aisle by the wrapped caramels. If you are looking for ways to save time around the holidays, using these is an easy one! Thanks for the tip, Theresa! I’ve never seen them in the baking aisle, but my store might keep them with the candy, I’ll definitely check next time! Amazing …! 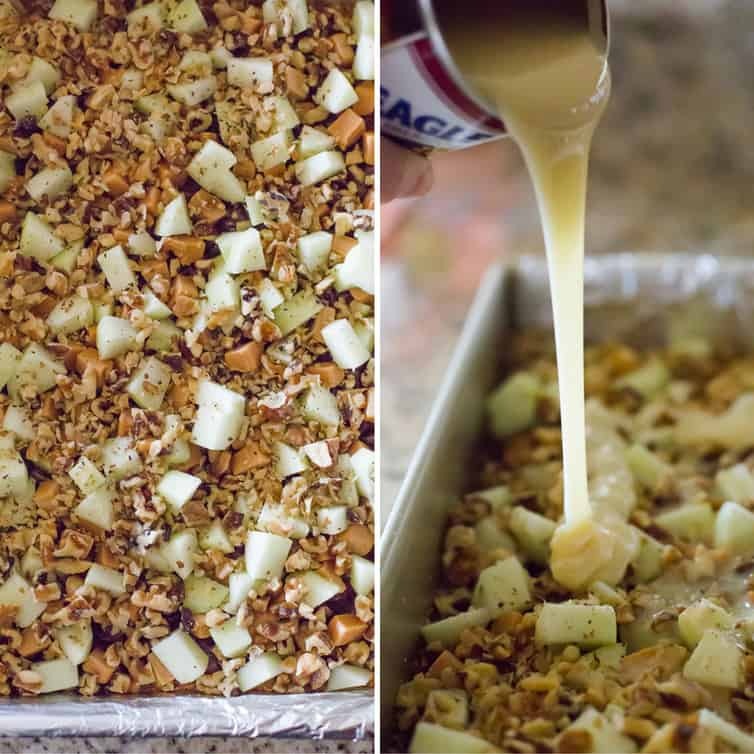 your caramel apple magic bars looks so delicious and creamy as well this is one of my favorite recipe till now. I will making this like you. Thanks for sharing and keep shared your new amazing recipes…. !